Cooking in an RV leads to shortcuts. The counter is only 12”x12” so there’s not a lot of room to spread out, while a limited water supply means clean up needs to be simple. Drop biscuits are exactly the kind of short cut I like to make. Rolling out dough is too messy for me these days; drop biscuits are quicker and just as delicious as the more proper rolled-and-cut kind. Tender buttery crisp biscuits are such a comforting food, and perfect in every situation. Spilled soup? Sop it up with a biscuit. Leftover ham? Put it on a biscuit. Tired of cereal? Dollop some jelly on a biscuit & call it breakfast. I can never decide whether I prefer them hot from the oven with a pat of butter, or cold and slathered with strawberry jam. 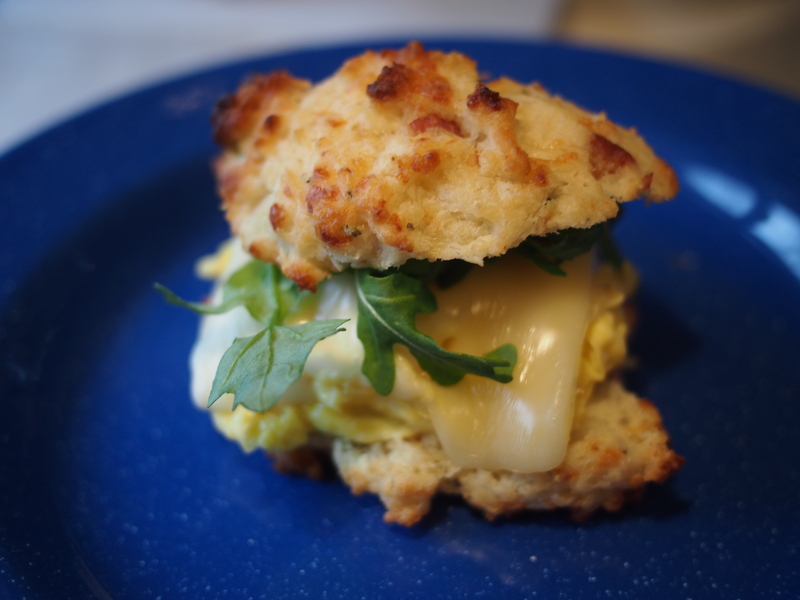 Today, we had these for breakfast – Bacon Cheddar Biscuits with Scrambled Eggs, Swiss and Arugula. And they were goooood. What are your favorite biscuit toppings? Sift together flour, baking powder, sugar and salt. Cut in butter until it resembles coarse crumbs. Add milk and mix with a fork just until moistened. The dough should be sticky – add a few more drops of milk if needed. Drop heaping tablespoons of dough onto a lightly greased baking sheet. Bake for 10 minutes or until lightly golden. 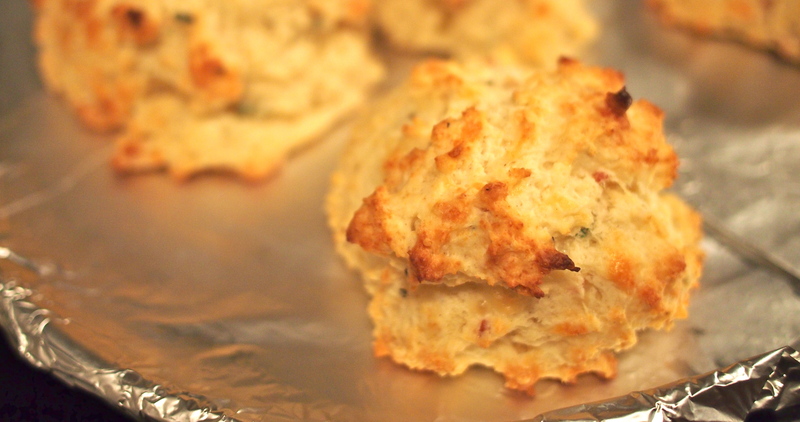 Bacon Cheddar Biscuits – Add 1 C grated sharp cheddar cheese, ½ C crumbled bacon and 1 Tsp thyme in with the flour. Buttermilk Herb Biscuits – Add 1 Tsp thyme, ½ Tsp chives with the flour. Use Buttermilk instead of regular milk. Walnut Biscuits – Increase sugar to 2 tsp. 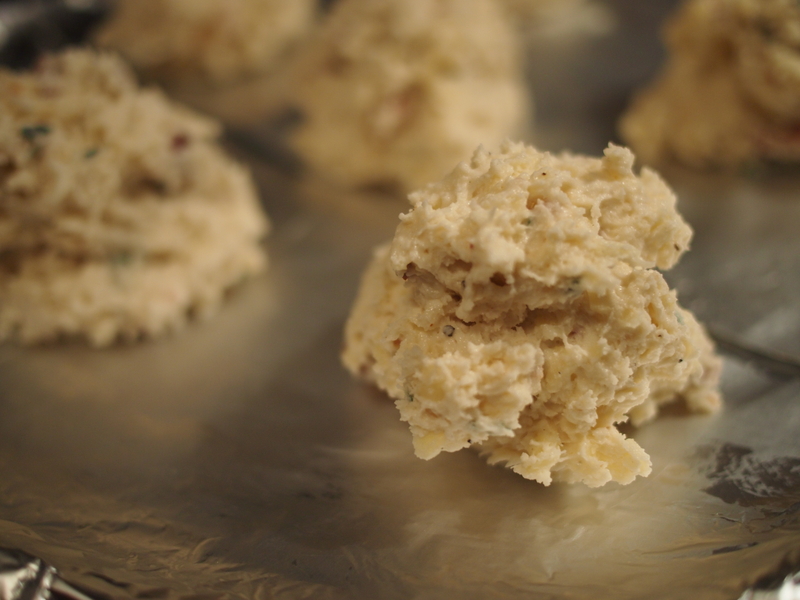 Add ¾ C chopped walnuts with the flour. This entry was posted in Food & Farmers, Recipes and tagged biscuits, comfort food, Food & Farmers, recipes, RV cooking by Propane Kitchen. Bookmark the permalink. Dad loved the drop biscuitis you made while you were here. He wanted to learn to make them. I advised while he mixed and measured and put them in the oven.- We eagerley watched them in the oven, but they didn’t seem right – not rising. We discovered when he was putting things away that the baking powder had been forgotten. So the chickens got the first batch of small hard biscuits. He made another batch and they were delicious. I agree, the drop ones are easier and just as good as the rolled ones.